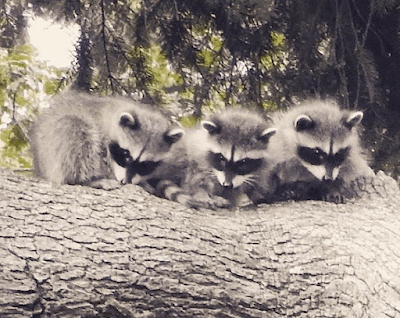 I published this post a year ago, but it's so packed full of raccoon goodness that I'm republishing. 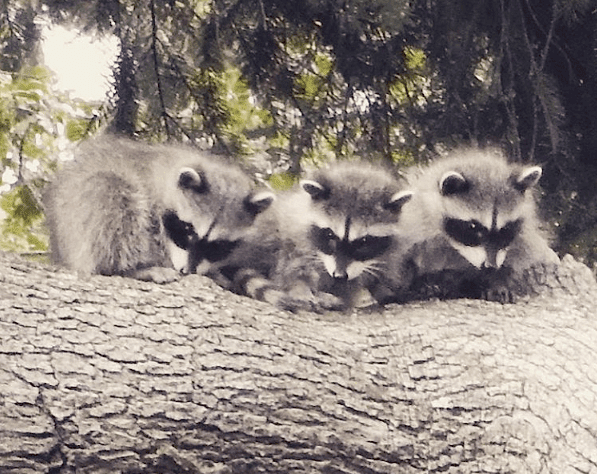 We have a family of five raccoons living in our neighbouring trees and I've been enchanted with these little guys all summer long. Sometimes the babies sleep on a large oak branch that overhangs right beside our deck! 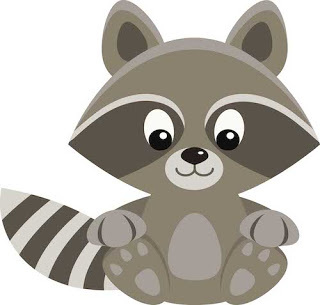 They've inspired me to make raccoon clipart (see below) as well as learn all I can about these nocturnal creatures. I've never done a raccoon unit before, but this might be the year. 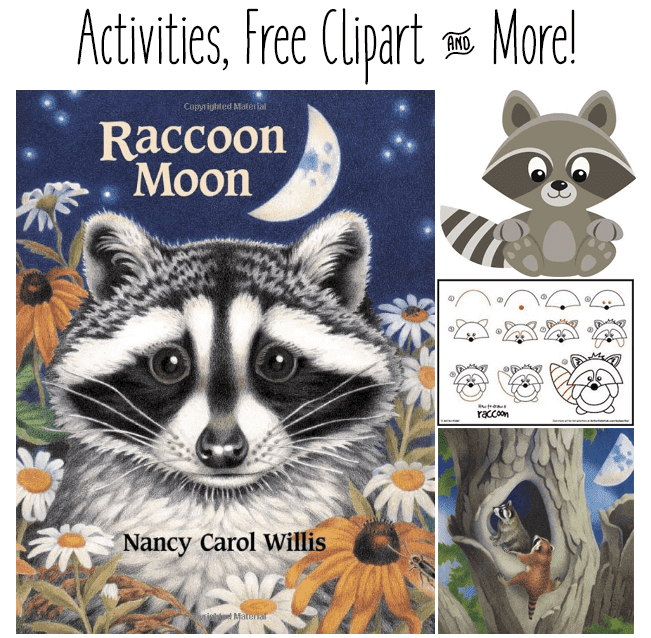 Below you'll find a brief review of one of my favourite raccoon books, as well as a list of other books I love, and some activities for home or your classroom. While there are LOTS of fabulous raccoon books, the reason I chose this one is because it combines fact with fiction in such a lovely way. 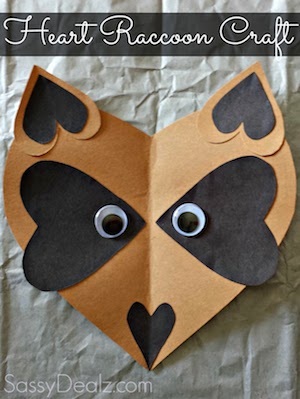 This book, along with Bobbie Kalman's "The Life Cycle of a Raccoon", should be in every classroom! It's a fictional story about a mother and her cubs, Rusty, Rudy and Spice. This beautifully illustrated text takes us through a full year in the life of a raccoon family. While it is chock-full of solid facts and interesting trivia, it's narrated in a gentle picture book style. The end of the book even contains helpful information about what to do should you ever come across a young raccoon. 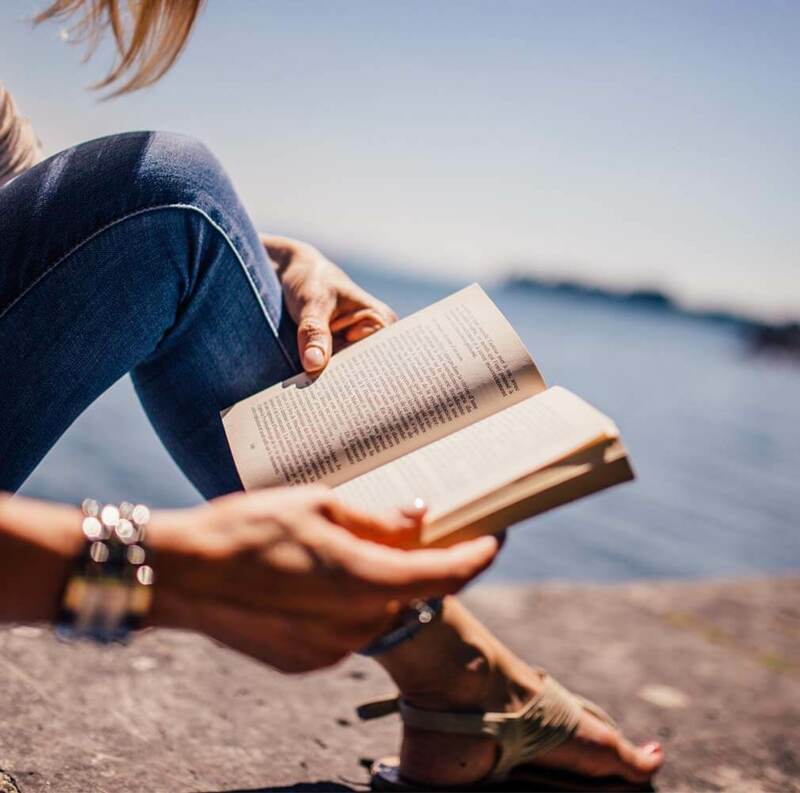 Ms. Willis has a website with her other books and lots of fun info. They're all about nature and animals. I love doing directed drawings in my class. Here's a good one! Click the pic for the link. 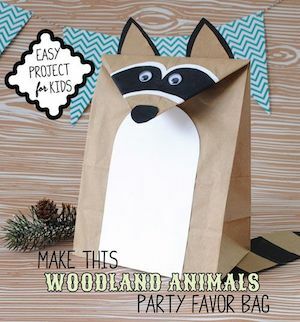 Although this idea is for a party favour bag, I think it would be perfect to fill with notes containing raccoon facts. It would make doing research a lot more fun! Again, just click the pic. 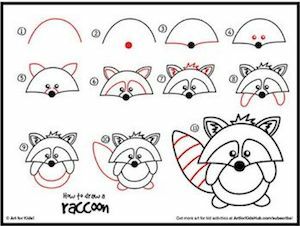 Want to make your own worksheet with a cute little raccoon? Click the image and he's all yours. The full set is further down. 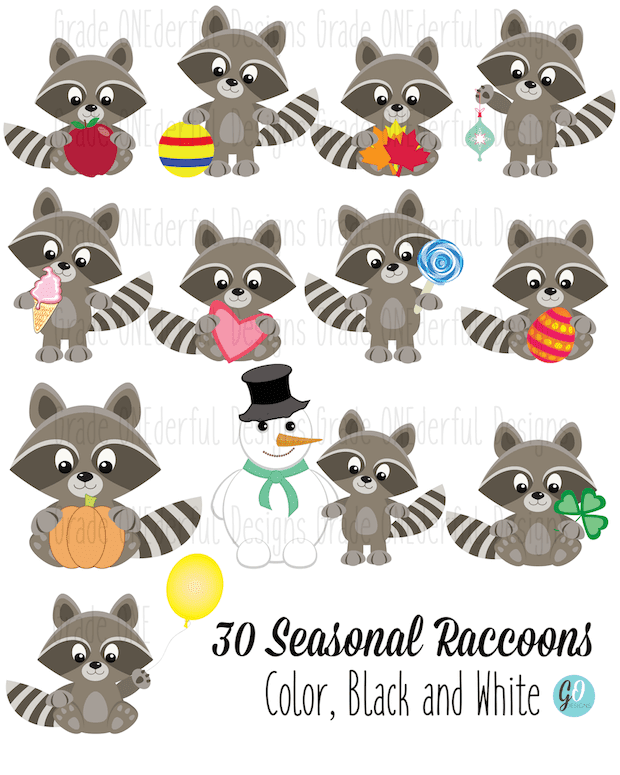 I just finished making a seasonal set of raccoon clipart. All the images are on transparent backgrounds and for $4 you get 30 images (including black lines). If you'd like to purchase, just click the pic and you'll be taken to my TpT store. PPS Here's a pic of some of the little rascals hanging out in my yard:) Thanks for reminding me, Erik! I love that clip art! Thank you!! We have a family of five going in and out of our garbage can. Sometimes the garbage isn't full enough and the baby at the end gets stuck until we let it out! It's a little scary when you open up and see a raccoon hissing at you! 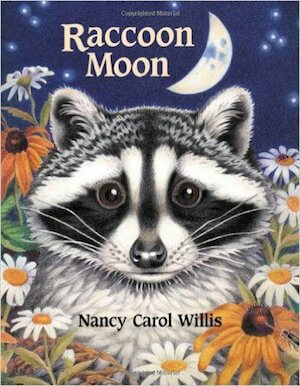 Wait Til the Moon is Full is another great book with a young raccoon as its main character. It's by Margaret Wise Brown so how can you go wrong with that?! I'm glad to hear you rescue the baby:) I don't think everybody would. Thanks for the book recommendation. I'll check that out! They are SO cute! We've enjoyed watching the baby birds, squirrels and a bunny in our backyard. Not as exciting as raccoons, but still fun.